Chickenpox is an infection that causes an itchy, blistering rash and is very contagious, meaning it is spread easily from one person to another. It is caused by varicella-zoster virus (VZV), which enters the body through the mouth and nose after contact with an infected person. 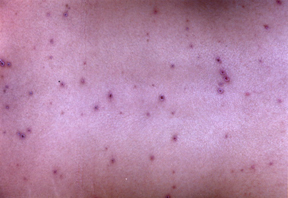 A person with chickenpox can spread the disease to someone else from one day before the rash appears until all chickenpox blisters have crusted over. Once someone has had a chickenpox infection, he or she almost always develops a lifelong immunity, meaning that person usually does not get chickenpox a second time.